These moreish little bites make great edible gifts or after-dinner treats and work well as part of a party table. Stick them onto cake pop sticks for added fun for kids (omitting the amaretto in this case, of course). 1. Snap 25g of the dark chocolate into a small heatproof bowl and melt it in the microwave in 30-second blasts, stirring between each go, or set over a pan of simmering water, making sure the water doesn’t touch the bottom of the bowl. Set aside. 2. Place all the nuts in a mini-blender and blitz until very finely chopped. Add the dates, cranberries, cinnamon and amaretto, if using, and blend until smooth. Add the melted chocolate and blitz again until well combined. 3. Line a baking tray with non-stick baking paper. Shape the mixture into 12 even-sized balls (about 20g each), arranging them on the lined tray as you go. Chill in the fridge for at least 30 minutes, until firm. 4. When the truffles are firm, melt the remaining 75g of chocolate as before and leave to cool a little. Pour the melted chocolate into a small, deep bowl. Dip a truffle into the melted chocolate until completely coated and allow the excess to drip off before returning it to the tray. Using two forks is probably the easiest way to do this. Chill in the fridge for at least 30 minutes, until set firm. 5. Meanwhile, melt the white chocolate as before and leave to cool completely and thicken slightly. Dust your clean work surface very lightly with icing sugar or cornflour, then roll out the icing paste on the dusted surface until it’s about 2mm thick. Use the small leaf shape to stamp out 24 leaves. 6. 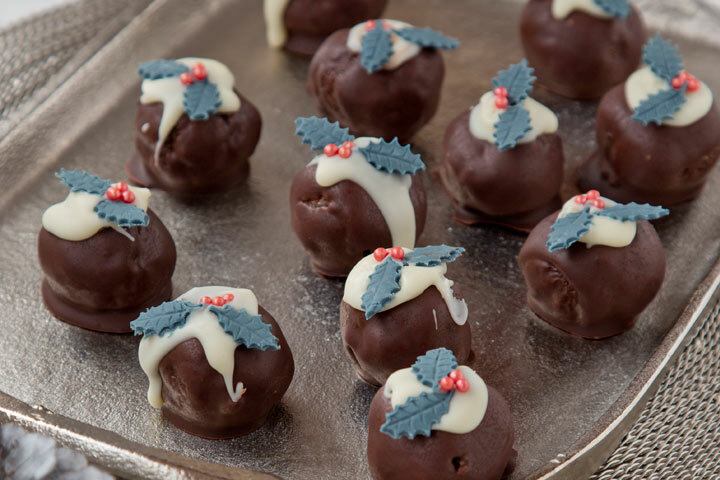 Spoon a teaspoon of the melted white chocolate over each truffle to just roll down the sides. Immediately arrange two leaves and three red edible balls on each one to stick. Return to the fridge for 15 minutes, until the toppings are set firmly in place. 7. These will keep for up to three weeks in the fridge, layered between parchment paper and stored in an airtight container. For a quicker decoration, omit the white chocolate with holly leaves and berries and simply top the dark chocolate coating with edible sprinkles before setting. You will need about 2 teaspoons for 12 truffles. Festive options include Deck the Halls, Snow Drift, Let It Snow, O Christmas Tree, Poppy Red and Jingle Bells from the SugarCraft range. For a healthier topping, sprinkle finely chopped pistachios and cranberries on the dark chocolate coating before setting. You will need about 1 tablespoon each of the nuts and dried fruit for 12 truffles.